The upcoming season of The Ultimate Fighter Brazil -- pitting Chael Sonnen against Wanderlei Silva -- will air exclusively in the United States on the new UFC digital network Fight Pass, premiering March 9. The highly anticipated upcoming season of The Ultimate Fighter Brazil — pitting Chael Sonnen against Wanderlei Silva — will debut on March 9 available exclusively outside of Brazil on the UFC’s digital network Fight Pass. The first episode of the series will air on Sunday, March 9 in Brazil with the availability in the states coming at 10pm ET/7pm PT on demand from Fight Pass just hours after the airing. There are also plans for another exclusive series of updates and interview from Sonnen called ‘Six Weeks With Sonnen’ that will be available exclusively on Fight Pass as well. Filming for the show is already underway with Sonnen relocating to Brazil for the next several weeks where he will coach on the show for the second time after going up against UFC light heavyweight champion Jon Jones for The Ultimate Fighter season 17 in the United States. Sonnen’s longstanding grudge with Silva will likely boil over at some point during the season, and he’s anticipating nothing but insanity from the Brazilian legend. "I don’t quite know what to make of it down here," Sonnen said in a press release. "Wanderlei has already been an experience, to say the least. He’s like a cartoon character, he gets angry and runs out of words and steam starts to come out of his ears. He’s a caveman. But I feel sorry for him so I’m helping him get to where he wants to go — retirement." Silva will certainly do his part to prove Sonnen wrong after almost coming to blows with the former middleweight contender last year at a bodybuilding expo in Las Vegas. Between that altercation and a couple of bizarre, heavy-metal laced interviews where Silva taunted and threatened Sonnen, this upcoming season should be interesting to say the least. "Sonnen messed with the wrong guy. Now his time has come," Silva said. "He’s fearful, afraid of me. For everything he said — now he has a payback. I’m here because of Brazil and the Brazilian fans. I’m going to give them what they want — the most exciting season of TUF ever." The new season of TUF Brazil will continue filming with the show airing beginning on March 9. 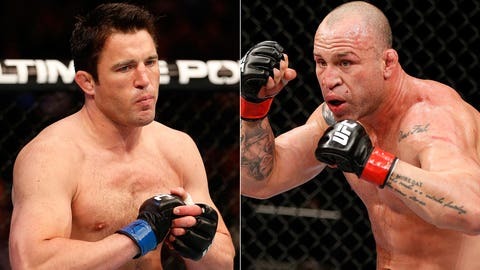 Following that debut, the date and location will be set for the show finale along with a proposed date for the fight between Sonnen and Silva.